Plastic cable stitch holders designed to prevent stitches from falling off. You can also read the full description or view all Clover Cable Stitch Holders. Nice that they come 3 different sizes! These are inexpensive and work well. They do the job holding cables, and the 3 size set easily matches all my projects. I gave this product a 4 star rating as they are not as nice a bit bendy as the metal version, but they do the job. I have had metal u shaped cable stitch holders before and really love these holders much better. 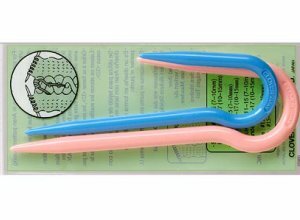 These are my absolute favorite cable needles, I love that you can just hook your stitches and then let them hang from the needles. They work great.